Beechwood house is a unique spacious property built in Kerala heritage style externally and to European standards internally providing extremely spacious and luxurious accommodation including air conditioning. Very close to many beaches, local transport, local amenities. Secure and peaceful seaside location surrounded by coconut trees and very friendly local people. And its roof garden and barbecue area is ideal for relaxing, dining and entertaining. The bedrooms are en-suite and air conditioned. Very comfortable living inside and outside. There are two large bathrooms, fully tiled, large mirror, shaver plug, rain fall showers, wash basin, toiletry cabinet are provided. Hand towel and bath towel provided. Fully fitted kitchen with granite worktop. Electric oven, microwave oven, fridge, freezer, gas cooker, electric chimney, kettle, toaster, blender etc provided. And there is a full set of crockery, cutlery, pots and pans available. There is a golf course in Trivandrum approximately 30 minutes drive away Trivandrum golf course is the second oldest golf course in india established by the Maharaja of Travancore and now managed by the Trivandrum golf club with a membership of over 400 members. Course is open to domestic and international tourists. The course is situated in the city adjacent to the Maharaja's palace. Notes on accommodation: Beechwood house is very suitable for children, families, couples and small groups. Pets welcome. Key locks on all bedrooms, front door and key cabinet fixed and electronic safe locker fitted on each bedroom . Plentiful ceiling fans. Room are air conditioned, fans fitted in all rooms. extra beds available for children to maximize capacity, by arrangement. You will get a welcome pack of milk, butter bread, tea, coffee and water. Particularly suitable for all family members. Outside: A small and beautiful garden, car park and gate surrounded by compound wall. Enveloped in a coconut grove of rural living, grazing cows, goats, cormorants, chickens, woodpeckers and kingfishers. With friendly local people going about their daily business, birdsong and stunning views surround you. All outside sitting areas and veranda have ceiling fans and lighting. All are furnished with easy chairs and tables Utility Room: There is a separate area for laundry . A fully automatic washing machine, ironing board, laundry basket and airer provided. Cleaning / Towels / Linen / Maid service: Bedding and towels are changed once in a week ( or depends on request) plus basic cleaning. Washing machine provided and laundry service available on local tariff. You can also bring your own linen. 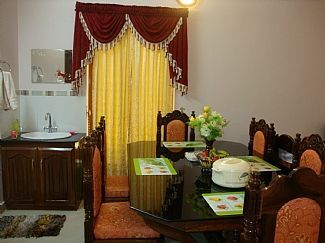 Other: Sit-out, long spacious sit out furnished with long heritage style chairs (charupady). Cane highchair, hanging cane chair, tea table , ceiling fan are arranged . Well situated for a truly local experience. Ideally situated in heart of Sumadra area, walking distance to shops, restaurants and local beaches. Sit on the veranda and watch and listen to the world go by, everyone smiles and waves as they pass. Furnished in typical Indian style , sleeping four in two double beds, both en-suite.A/C in bedrooms worked well.Sufficient hot water.Washing machine /iron helpful. Limited wi-fi per day, with many bars/restaurants having free wi-fi. Small front courtyard only but access to Molly's Retreat (pool and restaurant) 200yards away. Owner in regular contact, well supported by other local arrangements. End of a lovely two weeks. This is our 3rd visit to Kerala, the previous 2 spent in hotels, this time we decided to rent a villa instead, so glad we choose Beachwood. Joshy and his lovely family could not have done any more to make our stay memorable . The villa was clean and spotless fresh towels and sheets were supplied every week, There was a lovely porch to sit out on and watch India go by. The family, one evening made us a meal of mussels fresh fish and a host of local vegetables, delicious. We were even invited on the way back from a trip to Periyer to stop and have breakfast with Joshy extended family with a tour of the family Spice Plantation it was delightful. Also thanks must go to Mohan who was our driver and go to guy his help was invaluable. Thanks you very much for your great review. my wife and i had a great 12 days in Joshy's house, we had stayed in a hotel on lighthouse beach for the previous 5 days and the differance was amazing. The house is big, clean and away from the maddenning hawkers and street sellers, a place where you can see a little bit of how the locals live, yet its only a short tuk tuk back to lighthouse beach. The restaurants near samudra beach are great, the beach itself is a bit rough but if you walk over towards the leela it is quiet safe plus you get the bonus of seeing colours of the locals and indian tourists with there amazing beach habits. From my initial enquiry and throughout our stay and return from our holiday Mr George was in regular contact ensuring everything was satisfactory and that we where enjoying our stay at his property. The house manager was brilliant. We had a cancelled flight (24 hrs.) consequently missed connection, so two flights later arrived at Trivandrum, only to discover that our luggage wasn't there, and ground staff unhelpful and vague. Amazingly the house manager got our luggage to us within 6 hours of arriving, and throughout our stay he organised two trips for us promptly and well done. The property is a 10 minute walk from Samudra beach, which is quiet with some good restaurants. In the opposite direction a 40 minute walk will take you to Lighthouse Beach with is full of wonderful restaurants and much busier but lovely also. On our return journey we would get a tuk-tuk for £1! The property is well furnished, two large bedrooms with ensuite bathrooms, which was very convenient. Air conditioning which we didn't use, but we did use the overhead fans. Spacious kitchen, which I didn't cook in as we are out all the time, but all amenities there should you choose to. As a family with two teenage children we all loved this location and would recommend to all. We went to the backwaters (Alleppey) staying on a house boat for 24 hours, this was pricey but well worth it. We also visited a nearby elephant rehabilitation centre, where you can have a short ride on an elephant. The only draw back was the occasional Huntsman spider which did spook me and my daughter, but thankfully these appeared at the end of our stay! Mr George, the house manager and our driver where very attentive and nothing was too much trouble. We had our best family holiday yet. Just arrived home after a lovely stay at Beechwood house Kovalam set in a prime location close to all restaurants and the beech. The house is spacious and clean, and the house manager Jojan is always there to attend any needs at just a call away. he arranged for us to have a day trip on a house boat and arranged the train tickets for the next days return. There is also a taxi driver who is just a few doors away who takes you where you want to go , the local rickshaw drivers are friendly, as are all the local shop keepers .Highly recommemded and we are definitely going back next year. The 'backwaters' for drifting in a houseboat along the inland lakes. the nature reserves with their tropical birds, tea plantations, and large game parks in the western ghats. The ayurvedic massage and treatments for ailments, for which kerala is famous, are widely available. Dental and medical tourism is world class. Try kerala institute of medical science (kims) in trivandrum for executive check ups and medical work. Beechwood house is very close to Samudra beach (5 minute walk) is beautifully set with palm trees dotted on the headlands, with lots of other beaches around , an array of restaurants, gift and antiques shops, taxies, autorikshaws, tour and travel agents and tailors where your order is put in the morning and you are sure to have it made up and ready-to-wear by the afternoon. Another beach called light house beach is famous for numerous opportunities for eating out, shops, internet cafes etc. Nearest airport 14km Trivandrum international, 20-30 minutes drive away. we arrange a pickup for you at the airport! You must have a visa before departure. Local taxis and rickshaws are very cheap and in abundance. There is a very good bus service to Trivandrum where there is a mainline railway station. all approximate: Trivandrum airport - 25 mins, trv city 30 mins, backwater rice boat - allepey 3. 5 hours, wildlife sanctuary and hill station - Munnar 6. 5 hours, local tea plantation 1. 5 hours, cape comarine 1. 5 hours, Kovalam junction 15 mins walk or 5 mins by rickshaw. Beechwood house is within easy walking distance are many restaurants, banks, money change, internet cafes, tailors, shops, supermarkets, alcohol and beer shop. Ayurvedic treatment centres (renowned historical treatment for back pain, injury and other muscular and bone ailments) yoga, meditation, facials, manicure etc. Plus medical and dental care if needed. Also available are dental, medical and cosmetic procedures for superficial or more critical complaints i. E. K. I. M. S kerala institute of medical science in trivandrum may interest you. Kerala has an excellent reputation in these matters and prices are highly competitive (sort independently). Available on request are various short stay or day trips, for these the greatest attention will be payed to your safety, satisfaction and to the quality of your facilities. For example: the tranquil rice boat back water trip, allepey, an unmissable experience - wildlife sanctuary. Hill station - munnar, tea plantation, cape comarine (tip of india), varkala beach and cliffs, elephant festivals. Temples, mosques and palaces. This place is steeped in them! City shopping and culture trv, local boat trips, fishing and many other attractions on your doorstep. Also available is assistance with the purchase of provisions, alcohol etc. Plus a home delivery of fresh fish, lobster, prawns for self catering or the delivery of take away restaurant food for those evenings when you may wish to entertain or simply have a quiet night in. Please do not hesitate to ask me for helpful information and assistance in these matters. Booking Notes: 25 % deposit required at booking (non refundable). Full payment required 1 month in advance of arrival. Booking via owners.Please note that electricity price is not included with the price.You can pay by bank transfer or by cheques. Cheques to be cleared prior to arrival and £100 or equivalent in us dollars, euros or india rps to be paid on arrival in India to house manager in case of any major breakages, totally refundable before your departure. Changeover Day: As by flexible arrangement.